The Skasplash tour 1996 is over. Over for me. The rest of the crew is leaving for London. I won’t be part of the team. Nobody really understand that. I know that money is part of the understanding. The vans are leaving in the morning. Nathan says goodbye. I remember, that he said, I was important for the succeeding of the tour and that I made the tour nicer. All the goodbyes are from the heart and full of hugs. I just go back into the hotel to pick up Rolando Alphonso from his room. In the elevator he gives me 25 goulden (about 20 $) into my hand. I guess he wants to show me, that he enjoyed my companion. I feel myself like a servant, but I can’t say no to that gentle gesture. This man is too nice. I love him so much. I show him my painting from Aosta. He looks at it very carefully and say, that I am an artist. Will Clark says to me, the past doesn’t exist the way we’re thinking, it just stands for its own. The tour is over for me, I will travel back home with a lot of memories. First of all I go to buy me the train ticket to Lucerne, Switzerland. And I ask for the connections. I have to change the train in Bruxelles and Bâle, not to bad, but with all the heavy luggage not that easy. But before I go shopping, that CD I heard in Eindhoven. 5.15 pm Bruxelles North. I’m waiting on the track for the Edelweiss InterCityTrain, but it doesn’t come. There is nobody to ask. After a long while I take all my heavy bags and enter the station hall. I hear the information, that this train only scheduled on Saturdays and Sundays. But it’s Monday. The next train to Switzerland leaves at 7.21 pm. Arrival in Bâle at 1.40 am. I take the 25 gulden from Rolando Alphsonso to buy me a telefon card to call Switzerland, that I will be later. It’s 7 pm and I’m standing at the gate. Everything hurts, because of my heavy bags with the records and discs and so on, and I had to walk quite far with all that. Only because the information in Antwerp station was stupid. To give me on Monday a connection, that only works on weekends. 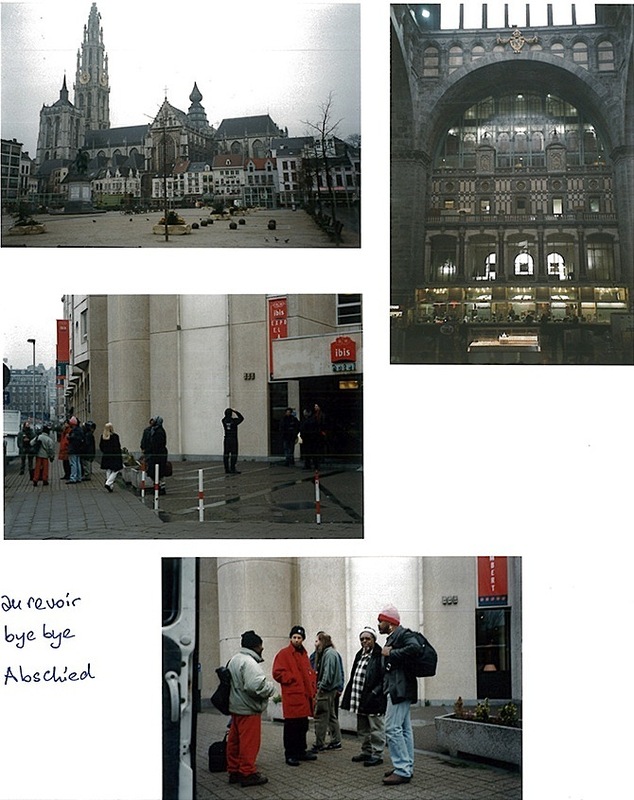 I would like to go back to Antwerp to tell this guy, what I think about this information. 10.39 pm the french border. I haven’t slept, but I feel a bit relaxed. The train is a great meditation and I’m all alone in this six-chair-cabin. I’m hanging in the past few weeks in my mind. 11.50 pm it’s snowing, the land is white. My headache is heavy and I don’t feel comfortable anymore. Will I get sick now? It’s like a very heavy bag felt from my shoulders. No, I don’t want to fall down into depression. It’s not easy to go back into the daily business. Back into 9-to-5-job. No. Just don’t think about it. 1.48 am another incredible story is just floating through. At the Swiss border two french officers guessing I have drugs with me. And believe me, my things I have with me, looks like drugs. I mean, all those herbs to prepare different teas, you call it drug. But those officers, they want to find Hashish oder Ganja. Oh I still have a little peas of Ganja that peas Herbert Spliffington in Hamburg gave me. Truly the officers find it and take it away. “Pour la poubelle” (for the garbage) they say. I told them a lot of the tour I was part of, but they are happy, because they found something (it was really very little, only as big as half a nail from the little finger!). They can’t find any rolling paper, nor cigarettes, nor alcohol, nor anything to smoke. But then I tell them, that I have sage (salvia) and that this herb also can be smoked. Finally they also take away the hemp bar (cereal bar with hemp, no drugs at all!). But lucky me, I don’t have to pay anything. But what a strange final. 2.12 am I find out, that there is a train from Bâle to Milano, that will pass Lucerne, but without a stop in Lucerne. I can jump out of that train just before it leaves Bâle. I change the train. There is the 4.49 am from Bâle to Lucerne, that is already waiting and is open. But it fills with people going to work. I’m very very tired. The train leaves and is full of fresh people. And everybody is speaking Swiss german. It feels very surreal. My thoughts were in English for the last month, I haven’t heard Swiss german for a while. 6.11 am I’m close to Lucerne. When I’m back I won’t have a flat to live and a whole lot of work. I want to write a book about this tour. That’s my plan. After 10 years the book is finished, but its in German and there is no distributor who wants my book. I take me another 10 years to find this blog to publish it straight. What’s my goal today? Maybe someone find it nice. Maybe someone asks me to write another story. I wrote two articles in Swiss newspapers, one about Lee Scratch Perry, the other about Ball Of Fire album of The Skatalites. Meanwhile it’s 7.10 am and I can tell, that I’m tired from the deep inside to the outside. From the bones to the brain. The last part of my travel, from Lucerne by bus to Root. In Root my parents had a house where I was living, in Root everything started with the Roots Connection. After the tour, there was a studio session with The Skatalites and Laurel Aitken. But Vin told me, that the recording is quite useless. It took a few years to find an engineer that made the sound useful. I don’t have that album. I wasn’t there, and I knew, why that session didn’t work. But that’s another story.